Everywhere on earth it’s now 2017, except in Ethiopia where it’s still 2010 and new year’s day is 11 September. At 2 630m, the air in Lalibela is gaspingly thin and you find yourself panting as you walk. But it’s the wild, craggy scenery that surrounds the town and the ancient rock-hewn churches that really take your breath away. They’re roughly 800 years old, weathered and worn, but still breathe with life – courtesy of the constant stream of pilgrims who visit every day. 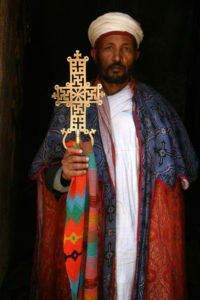 Each church also has a uniquely designed cross, carried by its priest, along with its own individual holy book of scripture. Hand written in the Amharic language and illustrated in bright clear colours, these holy books all tell different tales that include conventional Christianity and mother Mary, peppered with St George and a sprinkling of Egyptian saints and martyrs. The religion may be quirky to the outsider, and so is the timekeeping, alphabet and language here. Right now it’s 2009 in Ethiopia, since they follow the Julian calendar of 13-months. There are 12 months of 30 days and one of five days, during which they don’t earn a salary or pay rent. Their 12-hour clock leaves you baffled and works from sunrise to sunset, restarting again at sunset. 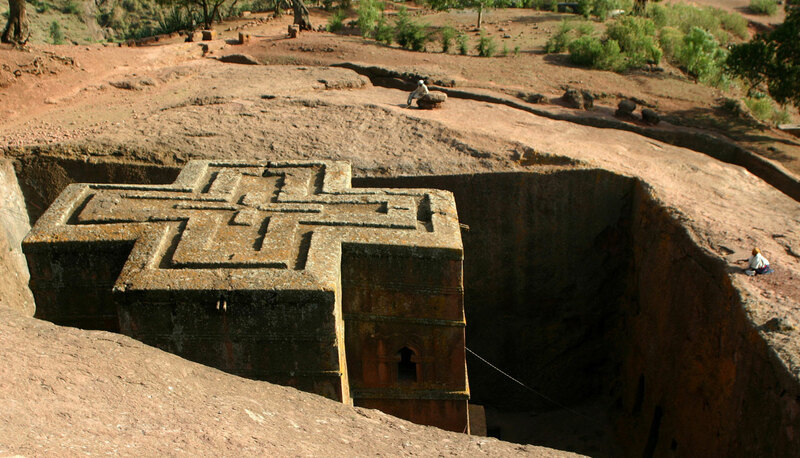 Just as unusual is their official ancient Amharic language and its corresponding alphabet that’s reminiscent of dancing figures. Add to this that Ethiopia is where coffee was discovered in 800AD, it’s where the Queen of Sheba lived and where the Arc of the Covenant is said to reside, and this is one truly unique country. Oh, and it’s the home of Africa’s only wolf species too.